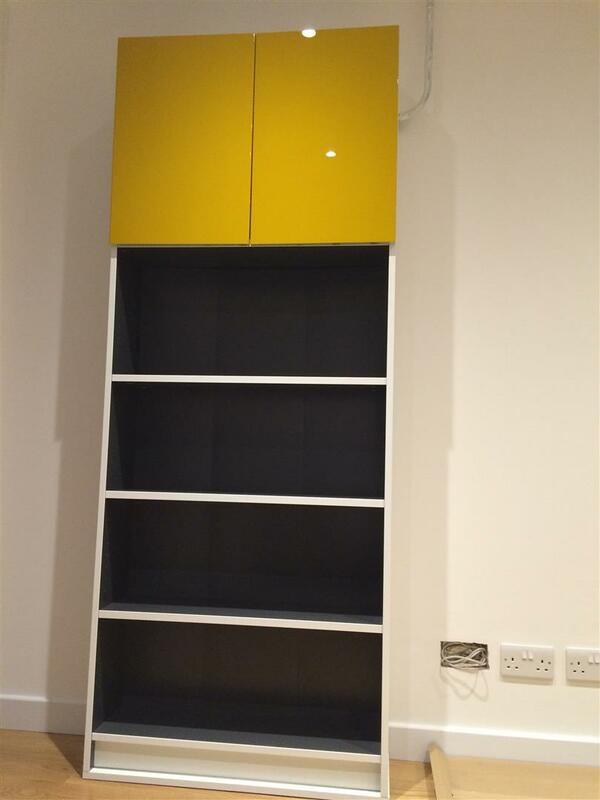 SOLUTION: IKEA hack solution using a BILLY bookcase with 2 kitchen cupboard doors attached to the bookcase. 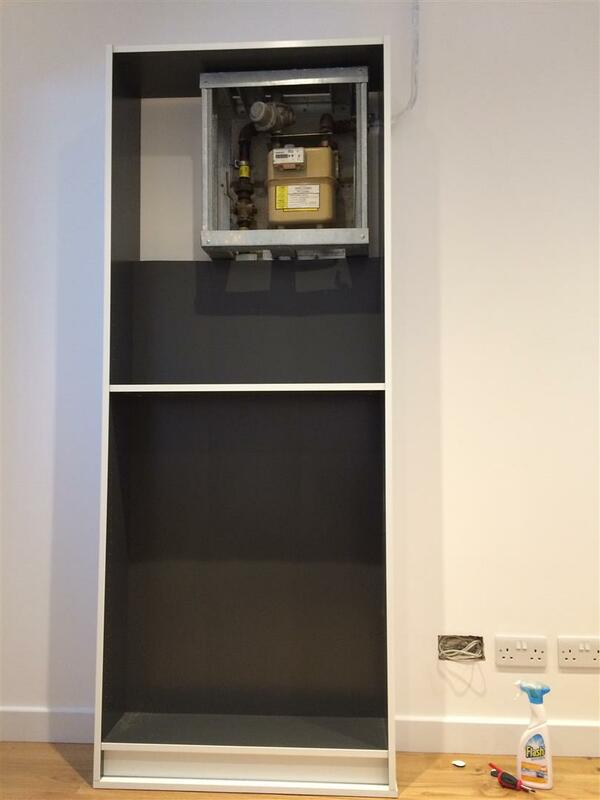 During our renovations we were quoted about £3500 to move the gas meter to a cupboard on the other side of the wall. 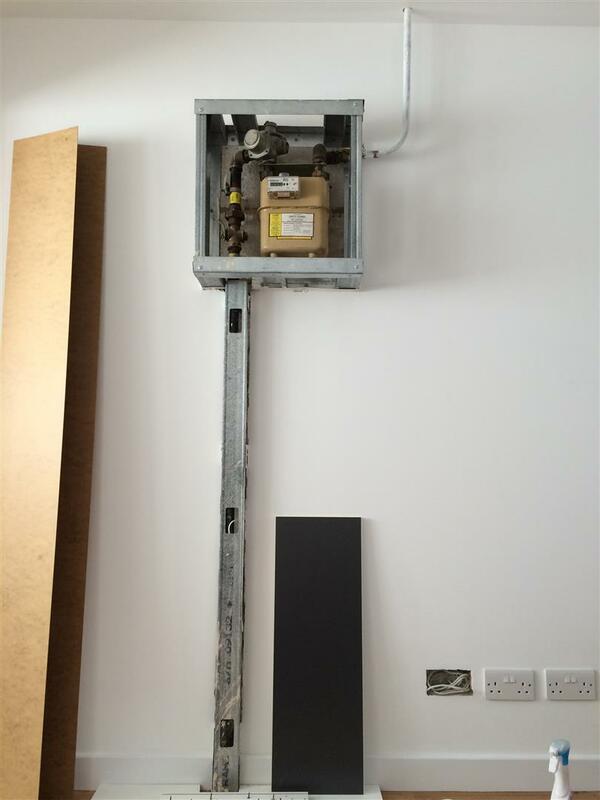 Since this would have been a rather costly exercise we decided to think of solutions on how to make the gas meter a less unsightly feature in the sitting room. We came up with many different floating wall cabinet ideas that we even tried out in the interior design software to get an idea of how it would look. (If you missed my post on the interior design software we used for our kitchen renovations then check it out here.) The other concern though was interfering with possible electrical cables located in the wall from drilling. I knew of the BILLY bookcase but only when I saw the dimensions and size of it in the store did it prompt an idea in my head. The dimensions of the bookcase are 80 cm(W) x 28 cm(D) x 202 cm(H). 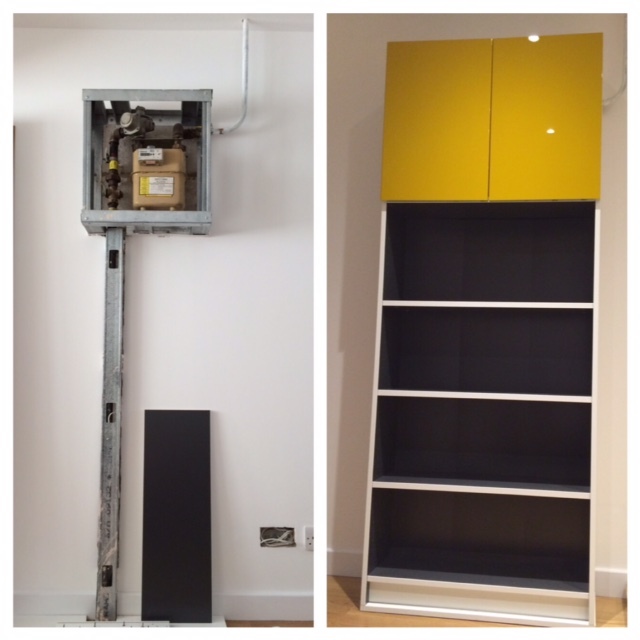 In comparison to a cupboard which can range from a depth of 40cm to 60cm, the bookcase is a lot narrower. I then walked excitedly over to the kitchen section to have a look at the available kitchen cabinet door finishes while the idea was brewing in my head. The solution was to reduce the depth of the shelves and bring the back of the bookcase forward. And so our IKEA hack was born! I unfortunately didn’t take any photos of all the hard work my hubby had to do to get the bookcase to the state in the picture below. So instead I’ve included an IKEA instruction pic in an attempt to explain where he had to make the biggest amendment. Obviously this was done before all the panels were fitted together. The original side grooves couldn’t be used for the back board because of the long pipe from the gas meter. So new groove lines were cut into the side panels of the book case to push the back board forward in to the book case (down to the red line). The blue circle indicates that new pin holes also needed to be drilled for the new narrower shelves. The shelves were then cut narrower to accommodate the now narrower depth of the bookcase (due to the pipe behind the backboard) and the gloss kitchen cabinet doors were attached to the bookcase. The doors are actually a mustardy colour rather than bright yellow. The pipe sticking out to the right was repainted and is now less obvious. I can’t believe after almost 4 months of DIY/home renovation posts this post now brings me to the end of this series…well for now 😉 I hope you’ve found my posts informative and enjoyed reading them as much as I have enjoyed revisiting the whole process. I may still share other DIY or home renovation posts in future on an ad hoc basis. I’d love to hear your comments on our IKEA hack or if you have any questions about our hack. I also welcome comments on what you enjoyed most or found helpful in my renovation series. Previous Post Santorini you gorgeous thing you! Check out this tip for hiding your gas meter. Hi. Did the kitchen doors fit perfectly on the billy bookcase? Thanks. Hi Joanne, yes they did! But I now know that the Billy bookcase also has the option of doors as we’ve bought another one since writing this post.